Found these treasures in my forgotten compost bin. I'm experimenting with Instagram and loving it! #3 My librarian friend at Kalama rocks! Interested in Maui Instagram accounts that shine? Check out Best Maui Instagram Accounts posted by Kelsey Love. Feeling thankful for Maui rainbows and those special people who are preparing our food for tomorrow. What a privilege it was to be involved with "Imagining a Better Tomorrow", the first student-led TEDxYouth event for Maui students! The event was held on April 6, 2014 at Seabury Hall's `A`ali`ikuhonua Creative Arts Center. 1. A TEDxYouth event on Maui works. There were a few doubters. Could an event of this kind draw an audience on Maui? Would students come up with talks that were TEDx quality? Could kids actually plan and execute this gargantuan project on their own? The answers to all three questions? A resounding YES! The students' talks will be posted on the TEDx site shortly. I will add them here for your enjoyment. Got a project that kids believe in and that excites them? Just get out of the way and let them at it. Planning for the event started at the beginning of the school year, continued with regular meetings and training, and culminated with a "hell week" of rehearsal and loose-end tying. All student-run. 3. Kids on Maui dream big. I didn't know there were so many kids who do, until now. 4. An #eventofhope provides real-world opportunities for students to continue dreaming. Some of the students who organized the event have leads for summer jobs and internships. Speakers are being asked to present elsewhere. Members of the student film production team that trained under AKAKU are now employable. The non-profit make-a-difference booths attracted many interested students who will now pursue new dreams. Maui students give me hope for the future! A big MAHALO to Jasmine Doan, founder of the event, who directed the core team of organizers from small start to spectacular finish. Learn more about TEDxYouth@SeaburyHall on their website, as well as on Facebook, Twitter, and Instagram. Cross-posted at mauilibrarian2 in Olinda. There seems to be something for everybody at Fourth Friday in Kihei and I couldn't possibly do justice to the event. You'll just have to check it out for yourself! This trip, cookies and flowers called out my name. The Maui Cookie Lady sells the most interesting, gigantic gourmet cookies! There is, of course, The Maui Cookie. But how about Cat Nip? Or best seller Bacon-Nator? Or AllAmerican Fried Chicken and Waffle? $4 buys an interesting cookie -- so worth it -- with bragging rights. Unsurprisingly, the line was long, all night long. Yum! Joey of Manutea Nui E does Hawaiian and Tahitian Costumes, so the flowers she makes must look real, she says. I bought two hair clips because I absolutely love wearing a flower in my hair and sometimes I can't get them fresh. Check out the array of accessories on the website. Watch it LIVE via a Live Stream by Akaku! Check out Fourth Friday in Kihei -- yes, do it! The Maui Farm is a place that's full of little hopeful signs. Lisa gave our little school group a tour of the entire magical farm. Thanks, Lisa! ... and she let us pick some herbs to take home. Now I'm inspired to expand my little garden at home and to spread the good word about the worthwhile work The Maui Farm does to support Maui families. 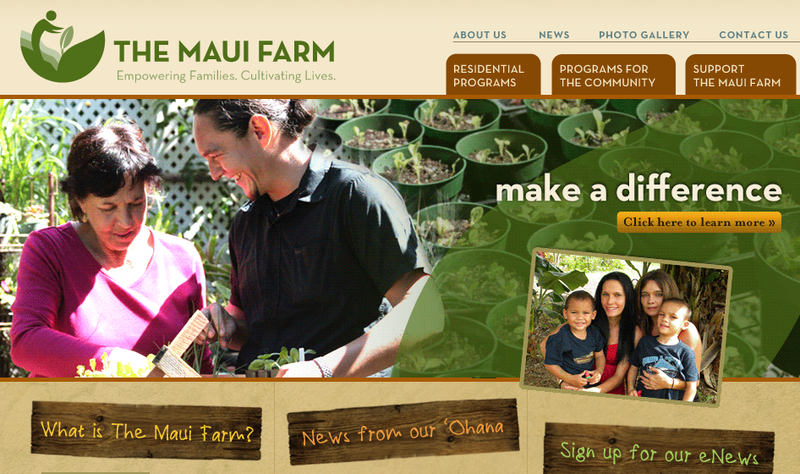 For information about The Maui Farm's family-strengthening residential program, farm-based educational programs, and how to make a difference with a donation, check out their website. Yes, I remember when they were at the Kahului Shopping Center. Yes, I loved the beans too. Post by Linda J. Lindsay.